Marlene Mountain & Francine Porad. Cur*rent Linked Haiku © 1998. Saddle stitched, (5.5" X 8.5") 28 pages. An excellent collection of linked haiku by two of our best contemporary American haiku writers.The first few series were written over extended months, obviously flowing at the rate of snail mail. These linked haiku move through the seasons and political events with a fresh shifting of attention from the immediately local (sometimes biologically personal) to the global current events in their lives. Marlene Mountain, formerly known as Marlene Wills, was born in Ada, Oklahoma, on December 11, 1939. A visual artist as well as poet, she has a B.F.A. and M.A. in painting and has had numerous group and one woman exhibitions. She currently paints and writes on a mountain in Hampton, Tennessee. Mountain's first volume of haiku, the old tin roof, was published in 1976. It was an innovative production combining her visual art background with haiku. The book was published in a long page format (3.5 x 8.5 inches) which allowed her room to experiment with one-line haiku and concrete poems which she referred to as "unaloud haiku." By manipulating typographical elements such as letter spacing, word spacing, characters and arrangement on the page, each haiku has space for a unique reading experience. A second collection of her visual haiku, moment/moments was published by High/Coo Press in 1978. In 1978 she wrote an important essay, "One-Image Haiku," which was originally published in the Australian haiku magazine, Tweed, and reprinted in A Haiku Path (Haiku Society of America, 1994). In this essay, she resists the conception of haiku as necessarily containing two juxtaposed images and champions a more inclusive conception of various types of haiku. In another important essay, published by Modern Haiku in 1988, she calls for women to "create haiku from experiences which are unique to ourselves as women . . . experiences which only women can write. Experiences which celebrate or 'confess' or proclaim or express womanness" (Volume 19.2, page 32). See Marlene Mountain's web site. Francine Porad lives, writes and paints in the Seattle, Washington area. Former President of the Haiku Society of America in 1993 and 1994, for eight years she edited Brussels Sprout, an international journal of haiku and art. 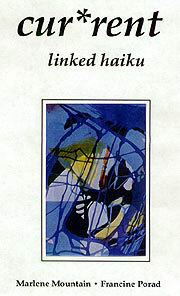 Her haiku are in current issues of publications in the U.S., Canada, England, Croatia, Australia, Romania and Japan; in many anthologies, including Haiku Moment (Charles E Tuttle, 1993) and Haiku World: An International Poetry Almanac (Kodansha, 1996). Francine Porad is a frequent guest lecturer, an award winner and has juried many national and international haiku, senryu, and tanka competitions including Haiku Society of America, 1997; New Zealand International Haiku Contest, 1995; North Carolina Poetry Contest, 1994; Washington Poets, 1994; San Francisco International Haiku & Senryu Contest, 1992. She has a B.FA. from the University of Washington, 1976 and juried membership in the Northwest Watercolor Society, Women Painters of Washington, and the National League of American Pen Women (Art and Letters). She received 1st Prize for the Washington State Art Exhibition (Frye Museum), 1993 and1st Prize in the Oregon Branch Haiku Contest, 1995.